This hotel has been completely updated. Fantastic hotel very good food, with some good selections. Sometimes the food could be hotter. You get your dinner plates from the "show cook" counter as they are nice and hot. The hotel is adults only which for some makes it a nice relaxing place to stay. Great location... only problem is the looky men are a right pain. But a nice short walk to some great shops and very friendly bars with a pint at 0.95 cents not bad at all. Had to move to this hotel on Christmas Eve due to Princess Dacil being overbooked. On arrival didn't think the hotel looked up to much but got a warm welcome at reception and the entrance was decorated beautifully with Xmas decorations. Our room was furnished nicely and spotlessly clean, we would have prefered a room on the opposite side overlooking the sea rather than the main road with barking dogs all night but we were only there for two nights. The dining room was nice with an excellent buffet breakfast which we ate on the outside decking on Boxing day. Good value for money hotel. This was our second visit. The arrival day was cool and we soon found we needed the blankets available. After a few days we realised the Curtains were moving due to the Windows not fitting flush. Watch out, Chambermaids dont always knock first. Rooms clean and Staff polite and cheerful. The Restuarant is Delightful, but we did return dirty plates on two occasions. you sometimes had to wait for foodtrays to be replenished, and clean dishes. waqs more like mousse consistency. This seemed to amuse one person!. The Location is first Class and the Hotel itself is most pleasing. Desk staff are approachable. really see that much this visit. The Pool Area isnt that big, but adequat. Watch the plastic type Chairs though, as one collapsed under an elderly lady. Lovely hotel with a good location and lovely views. Rooms were spacious and kept very clean. The entertainment was very good and the animations team (Remick and Helena) were excellent.They worked hard to please several different nationalities and in doing so made such a wonderful friendly atmosphere,very professional.Already planning to return to this hotel next year. Very mixed clientelle, German, Dutch, British which was reflected in the food in the restaurant with something for everyone. The full English for me. This hotel is in a perfect location right on the promenade, with wonderful views. The pool is very cold may I warn you all and comes as a shock to the system after being in the warm sunshine. My mum and I stayed at the hotel Moreque for a week in June and we both agreed that it was a really nice little hotel! All the staff were very friendly and made you feel welcome. Our room was spotless, the maid cleaned it every morning. We had a sea view which was fantastic. The food was nice, there was a lot of variety. Overall, the Moreque was an enjoyable place to stay and I would definatly return! What a great little hotel. Fantastic position right on the beach front,with great views acroos the bay and towards the harbour. One of the first hotels to be built in Los Cristianos, but has been tastefully kept up to date without being gawdy. Our room had recently been refurbished(the bathroom fittings were brand new),and was absolutely spotless. The food in the restaurant was excellent, and the breakfasts were more than enough to see you well into the afternoon. Only a small bar,but adequate, and the pool area was well kept with plenty of sun-beds on offer.All the staff were more than willing to help when needed and the girl in reception was particularly jovial. Would not hesitate to return. First visited this hotel in 1999 and decided to return for a second visit due to our very pleasant experience. Booked flight and hotel on the internet as we could not find it in brochures and found it not only cheaper but very easy to carry out the transaction. We found the hotel to be still spotless and the same very friendly and helpful staff most of whom were still there from `99 which says a lot. The rooms are of a good size with plenty of space to move around, good sized modern bathrooms. A sea view is strongly recommended as we spent many happy evenings sitting watching the comings and goings in the harbour which the hotel overlooks. Evening entertainment is typically holiday material but enjoyable. The negative factor was unfortunately the food which had fallen considerably in standard since our previous visit resulting in us laterally eating out at local restaurants. A great pity as this spoils all other positive aspects of the hotel. My recommendation is take room only and eat out till this matter is rectified and still enjoy the tranquil atmosphere of the Oasis Moreque. A word of warning! We travelled for the first time by Globespan, a pleasant flight as good as any other airline but watch their baggage limits which they apply strictly especially on the return flight. It cost a number of people quite a bit of unexpected money. 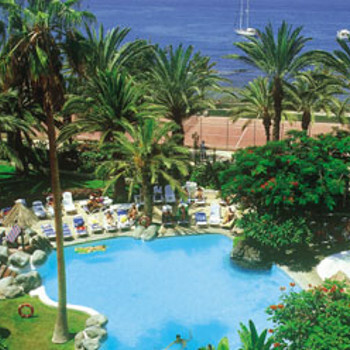 We stayed at the hotel Oasis Moreque at Los Christianos in Tenerife. We all had a fabulous time my husband, daughter and her boyfriend and me. The hotel was extremeley clean and comfortable. All the staff were friendly and helpful. The entertainment team spoke five different languages and chatted every day to everyone.They got the people involved in games if they wanted to but didn't pester if they didn't. The food was lovely. Everything you could want for breakfast including full English. Dinner was a wide variety including vegetarian which pleased my daughter.The hotel was situated on the outskirts of Los Christianos which was nice and quiet but a few minutes walk and you were within the bars and shops etc.We paid extra for a sea view which was really worth it because it overlooked the harbour and the swimming pool as well.The pool was always kept really clean and was very pretty surrounded by palm trees and flower beds. We all would highly reccommend this hotel and would certainly go back again. This is a very nice hotel went with anoter couple in june we also paid extra for the sea view which was superb you were so close it had great views over the pool and the harbour well worth the money. Nice pool area with good entertainment staff doing pool table tennis french bowls tabble tennis spanish lessons shows and more they were very good and worked very hard. We were on half board now im not a lover of the hotel buffet but it was ok we all much prefered to eat out in los christianos bay 5 mins walk away but the hotel food was not to bad tried it once and had a couple of brekfasts.